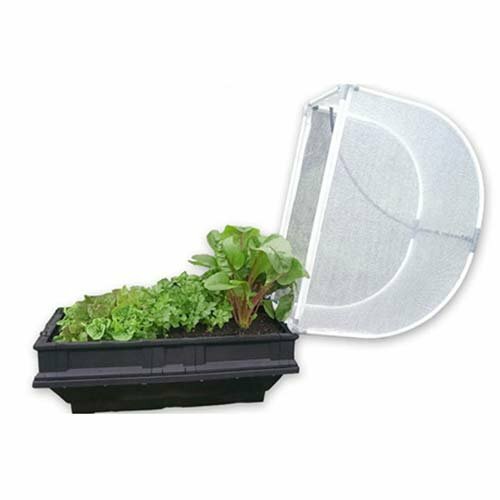 Vegepod prides itself on providing the average person with a simple and easy way to grow vegetables at home. Our garden kits are the most efficient and practical on the market today. 1m x 0.5m (39in x 20in) garden kit. Now you can easily grow veggies on your balcony, patio, verandah or courtyard with this small Container Garden with Vegecover. It provides protection from wind and pesky wildlife. Assembles in about 20 minutes. Self-watering and easily raised. Now you can easily grow veggies on your balcony, patio, verandah or courtyard with this small Container Garden with Vegecover. Generous 5.4 square foot, 775 square inch, 39.4in x 19.7in (1m x 0.5m) container garden kit. The cover provides protection from wind and pesky wildlife. Easy set up. Assembles in about 20 minutes. Self-watering and easily raised. Portable and easy to fill. Designed in Australia, growing veggies across America! If you have any questions about this product by Vegepod, contact us by completing and submitting the form below. If you are looking for a specif part number, please include it with your message. Greenes Fence Premium Cedar Raised Garden Bed, 16" x 96" x 11"
Sunward Patio Raised Garden Bed Kit / 36" x 36" Toolless Construction For Easy Assembly / Perfect For Summer Gardening!